This dictionary covers figures of historical, literary or religious significance who flourished between 1730-1860 and were associated with the evangelical movement in the English-speaking world. 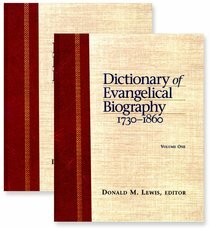 About "Dictionary of Evangelical Biography 1730-1860 (2 Vol Set)"
Donald M. Lewis specializes in Victorian evangelism and is professor of church history at Regent College, Vancouver, British Columbia. He is also the editor of the Blackwell Dictionary of Evangelical Biography.